After teasing the Path Of Exile community for the past numerous weeks by giving them a small taste of what they can expect in the December update, it appears Grinding Gear Games, the studio behind the free-to-play action-RPG is finally ready to reveal the update in full. As The Elder grows more powerful, he will consume The Shaper’s creations to manifest his own Guardians. The stronger the consumed boss, the stronger The Elder is when you face him. The Atlas has been redrawn. Find your way to the centre through new paths and discover new challenges along the way. 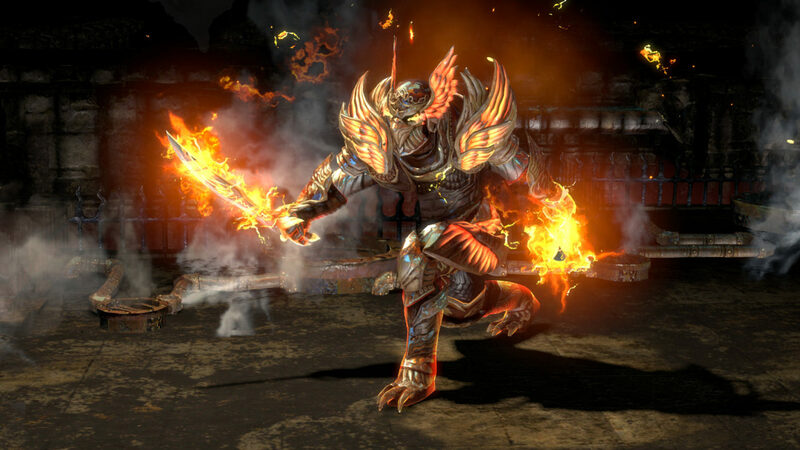 War for the Atlas adds 32 maps to Path of Exile’s ever-evolving end-game. As you fight in maps the Shaper or Elder control, you may find rare Shaped and Elder items which can be crafted to have powerful properties that don’t normally occur. This expansion introduces ten new Gems including four new Skill Gems and six new Supports. The new skills have a focus on necromancy, while the support gems are designed to augment as many skills as possible in new and interesting way. Path of Exile: War for the Atlas contains over fifty new Unique Items, many of which have been designed by our community. We’re also launching a new set of Supporter Packs alongside War for the Atlas. They feature the four exclusive armour sets worn by the Elder Guardians, as well as new weapon effects, portals, forum titles, portrait frames, t-shirts and microfibre cloth maps featuring the new Atlas. Alongside the expansion, we’re also introducing the Abyss Challenge League. Fight foes that spill forth from the underworld beneath your feet as you journey across Wraeclast. Claim valuable new Abyss Jewels to customise your characters and items in new ways. More detailed information about how the Abyss Challenge League works to be revealed next week. War for the Atlas is set to launch December 8 on the PC, with the Xbox One platform receiving the update later on.